Os grid reference: NR8162 9778. In Kilmartin Glen, Strathclyde region, Argyll and Bute, near to the village of Slockavullin there is a fenced-off area with an outcrop of rocks called Ballygowan Rocks, which are covered in prehistoric rock-art, dating back thousands of years to the Bronze-Age. The site is located beside a path and close to woodland about half a mile north of Tayness Cottage, Ballygowan, half a mile south-west of Slockavullin village and, to the north-west of the B8025 and A816 roads and Kilmartin burn. Ballygowan is a solitary little hamlet with no more than a few cottages. Kilmartin is one-and-a-half miles to the north-east and the town of Lochgilphead 10 miles south on the A816. This area is particularly rich in prehistoric rock-art, so you don’t have to go far before you come across rocks covered in cup-and-ring markings. It is well-worth the long trek, in the end at any rate! 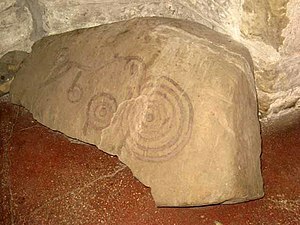 The Ballygowan cup-and-ring markings are carved onto the flat face of an outcrop measuring 2.5 metres. There are said to be at least 70 small, medium and large cup-and-rings here, some having radial grooves that link up with the cups, while other enlarged cups seeming to go into the natural cracks in the rock, and many having slightly deeper rounded centres than their counterparts. 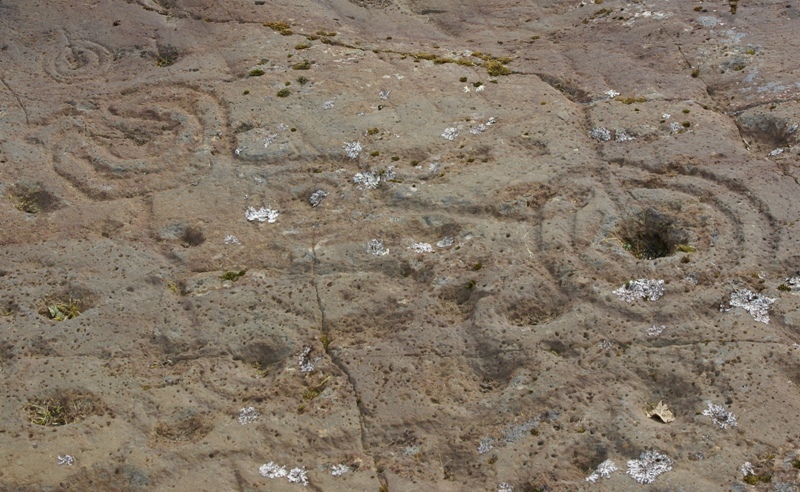 One cup-marking in particular resembles a horseshoe with several rings that stop at a ‘junction’ and then go outwards from the cup itself, while larger cups (some oval-shaped) go off into the naturaly-formed cracks in the rock’s surface; also there are ‘radial’ grooves or gulleys which link-up with other cups-and-rings. 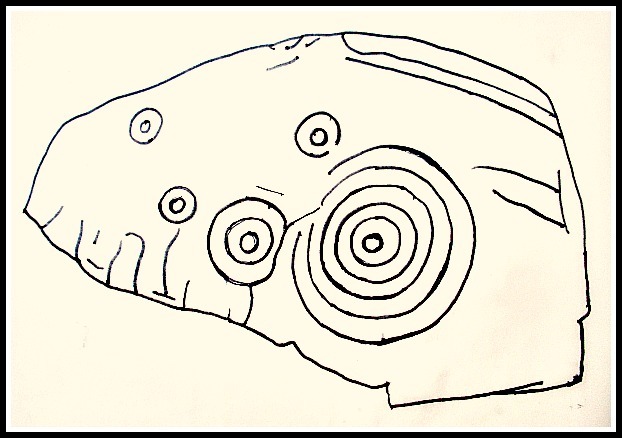 This type of rock-art is said to date from the Bronze-Age, around 2,500 BC. But why were these strange cup-markings and other patterns designed like this, and for what reason were they carved? Were they used for aligning the stars and constellations, or perhaps the setting of the moon. Maybe they were to ‘align’ features on the horizon, such as hills, mountains and valleys? Maybe we will never know for certain, we can only guess. But they must have mean’t something to our ancient ancestors as they wouldn’t have spent so much time carving these strange shapes. There are other cup-marked rocks in Kilmartin Glen at Achnabreck, Cairnbaan, Kilmichael Glassary and, further to the north at Buluachraig, all well-worth visiting. Darvil, Timothy., Glovebox Guide – Ancient Britain, The Publishing Division Of The Automobile Association (AA), Basingstoke, Hampshire, 1988. Categories: Cup-And-Ring Markings | Tags: Ballygowan Cup-And-Ring marked rocks in Strathclyde Region Argyll and Bute, Ballygowan Rocks in Argyll and Bute Scotland | Permalink.